Does it work in the blacklist lock application? Can someone who's been trying to answer? 7.4.20 does not work since the thread. English pls. Procedure will know fron next build. that will based in Nougat 7.0. Until that, flash regularry like previous builds. He wrote that procedure for updating to android 7 will be explained next week cause this update is not yet nougat based. For this week update normally from TWRP, next week you should find the procedure for the nougat update, maybe in the first post. Hi, excuse me but the mix file is based on android 7.0? I don't use second space or cloned apps, never used! I've tried to reinstall google search or shazam, re-added the widgets but at every reboot the will be deleted. "Due to Android 7.0 Adaptation process, the last Android 6.0 version 7.5.11 for Mi MIX / Mi Note 2 / Mi 5s / Mi 5s Plus is released today. Starting from 15th of May, the Closed Developer ROM Testing begins, we expected to take 3 weeks for bug fix and optimizations. 2. Update for Redmi Note 4, Redmi Note 4X/Qualcomm (4GB+64GB) suspended due to stability test." Sounds good. My Mi5s Plus has a lot of battery drain for some odd reason. Hopefully the closed builds in future will work out for the best. It says that today will be released the last 6.0 and from 15 May will begin 7.0 but for closed testers team, it's clear. Fingerprint not working on mi5s. Hangs after the first vibrate detection. The mix file says in the final part 7.0 so it is android 7.0. How to update? I download updates and run them through TWRP so is it the same? Yes, just wipe cache and dalvik after installing. On my mi5c lose a internet connection on download 0KB/s but i have a 4G and full signal. Sms, mms work, but download broken. I on fly mode at moment and off, and downloas resume, but this bug have many times a day. How can I view the available RAM again? How can I go back to stable from beta 7.5.4? And what about the telegram group? Go to Settings --> Home Screen and enable 'Show Memory Info'. [Quote = "albertkuba post: 368.479, membro: 136.957"] Si dice che oggi sarà rilasciato l'ultima 6.0 e dal 15 maggio inizierà 7.0, ma per la squadra di collaudatori chiusi, è chiaro. Man what things you dont understand? MIUI version is 7.5.11 but your Mix still is on Android 6.0 M. In next build will start with Android 7 Nougat. 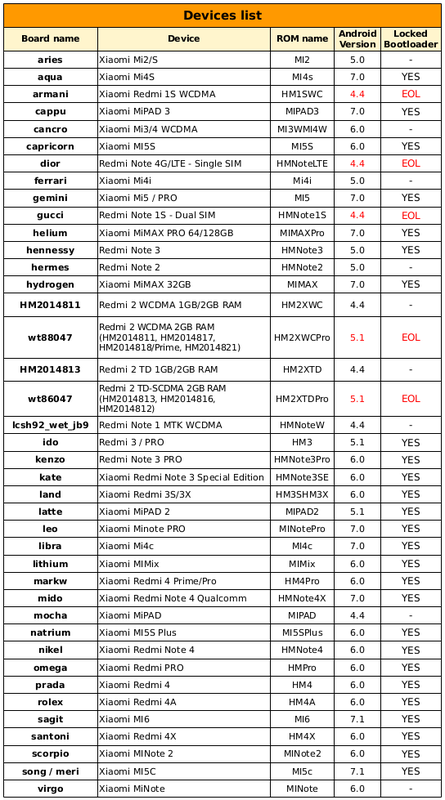 MIUI version is not related with android version.MIUI 7 != Android 7 ok ? On topic: Someone to share impressions from this build? Some issues, battery in first 2-3 hours. man do you have checked table in first post ? What Android version write for Mi Mix lithium code name ? i see Android 6.0. The end. @ingbrzy Also said it is Android 7.0. So there is an error in the chart! @ingbrzy Does it work in the blacklist lock application? Can someone who's been trying to answer? 7.4.20 does not work since the thread.